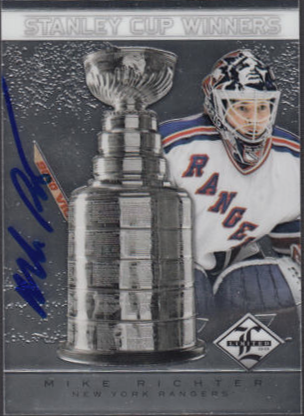 This is the third of eight posts where I’ll detailed for you one of my latests adventures in the hobby, Micro Collecting certified on-card autographs of all of the New York Rangers with Retired numbers. There are eight players and they are Eddie Giacomin, Brain Leetch, Harry Howell, Rod Gilbert, Andy Bathgate, Adam Graves, Mark Messier, and Mike Richter. 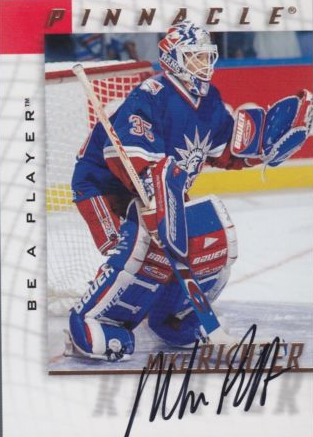 Totday we will take a look at Mike Richter, Number 35. Mike Richter had his number retired on February 4, 2004. Richter is only one of two players to spend his entire NHL career exclusively with the New York Rangers, the other player being Rod Gilbert who we profiled earlier. 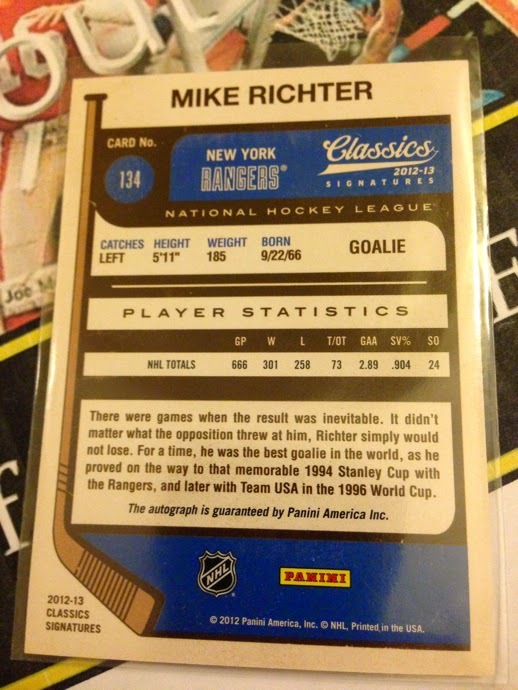 At the time of Richter’s retirement he was the all-time winningest goaltender in New York Rangers franchise history. He hoisted the Stanley Cup in 1994 and was named to the NHL All-Star Game 3 times. 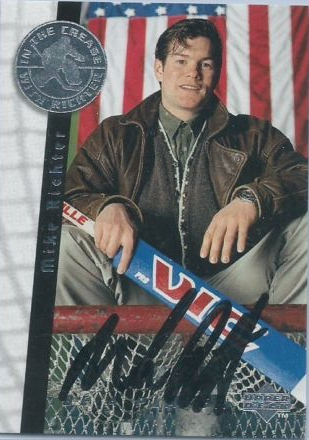 Richter won a Silver medal in the 2002 Winter Olympics in Salt Lake City representing Team USA. 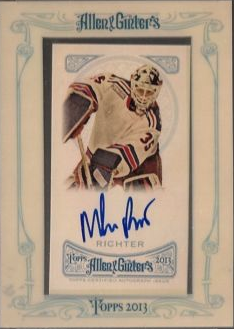 When it comes to Richter’s certified on-card autos he has signed almost as many as Gilbert and Giacomin combined. His earlier on-card autos come from the 1995 Be A Player line. He has signed pretty consistently from time and continues even now. What is not consist an is his actual signature. It can vary quite a bit which can serve as a point of frustration. Even within the same signing session for a specific card his signature can look very different from card to card. 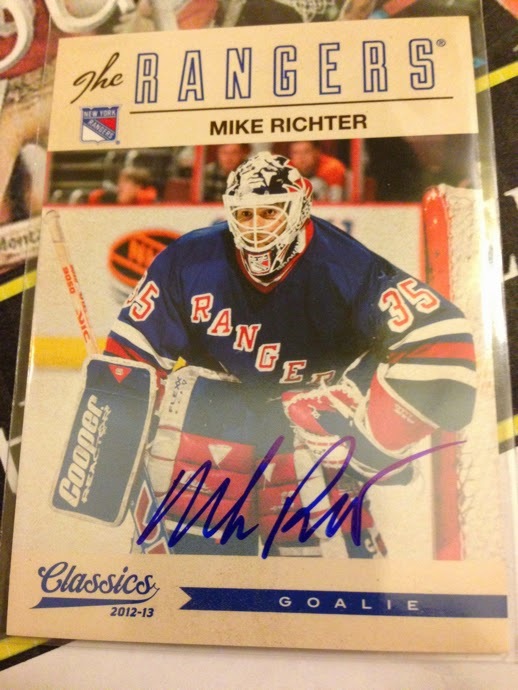 It was one of the factors in my selection of autograph, a 2012-13 Panini Classics Signatures. There were plenty of these signed so I had the ability to consent rat on finding a version of his autograph that appealed to me. I liked the entire line of 2012-13 Panini Classics, so its no coincidence the autograph cards had the attributes I look for, a nice sized photo and a clear area for a bold signature. The back of the card has plenty going on. Not a requirement in my book but a bonus. Next time I’ll cover the Ranger who helped bring the Cup back to the Garden after 54 years, Mark Messier.